So today I had company and after everyone left I realized I forgot to defrost the chicken for dinner tonight. So I had to find a way to make tuna into dinner.... and since my darling husband will not eat tuna noodle casserole, I had to be creative. I found this recipe and adapted it to fit my needs. It was originally from Starkist Tuna. My husband loves them and asked me to put them in the rotation. 4. Fill a small bowl with remaining bread crumbs. 5. 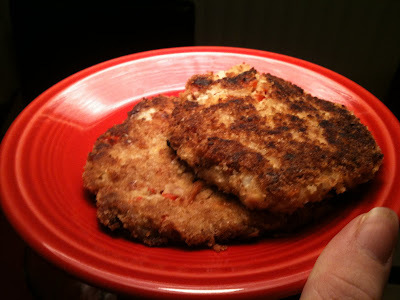 Coat patties with bread crumbs. 7. Heat oil in a large skillet. Add patties. Fry 4-5 minutes each side or until they are brown. Small patties would make a great appetizer! Large patties would make great sandwiches! I make medium patties and eat them like a crab cake.